Nîmes is a medium-sized city in Southern France that lies within the Languedoc-Roussillon region. 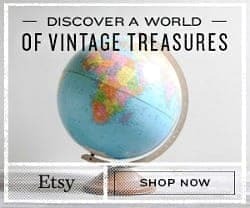 It is most known for its textile industry (the word “denim” comes from Nîmes), its Roman history (some wonderful Roman architecture survives here), its public gardens, and as being the final stop of the water carried by the 30-mile-long Pont du Gard aqueduct. Our visit to Nîmes happened to coincide with the annual Feria de Nîmes (or Feria de Pentecôte) that takes place during Pentecost. The Feria de Nîmes is one of the largest festivals in France and draws a lot of European visitors. 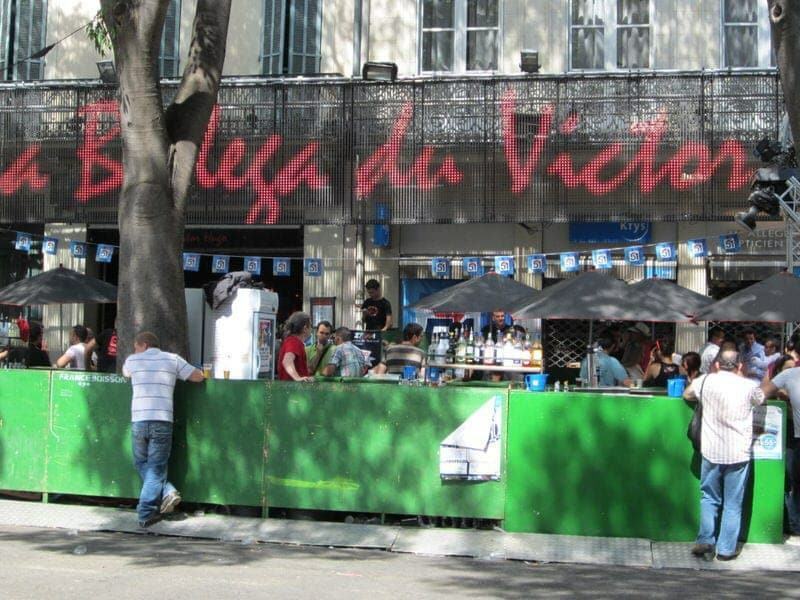 If you visit during this festival, you may forget you’re in France and believe instead that you’ve somehow walked to Spain as you eat paella, sip sangria, and observe bullfighters and flamenco dancers in the street. We’ll give you some tips for visiting Nîmes, some special advice on the Feria de Nîmes, and tell you about our day in Nîmes during the Pentecost festival. Nîmes is located in Southern France in the Langudedoc-Roussillon region. The city is near the town of Uzès, the Pont du Gard, and the Provencal cities of Avignon and Arles. You can drive and park at one of several paid parking garages and lots in Nîmes. Some of the closest are the Arènes Parking underneath the arena, Parking Maison Carrée, and Parking des Feuchères behind the train station. Train arrivals are easy as the train station is only about a 10 minute walk to the Roman arena. You can also arrive by bus; the buses come and go from the bus station conveniently located behind the train station – check the Edgard transit website for bus routes and times and you can buy tickets directly from the driver with cash. You can walk to all the sites in Nîmes from the train or bus stations. However, for those with mobility issues or during bad weather, you can also take a taxi or take the local Tango La Citadine bus that stops at the train station and makes a loop around the town. Nîmes main tourist information office is located at 6 Rue de Auguste, 30020 Nîmes. 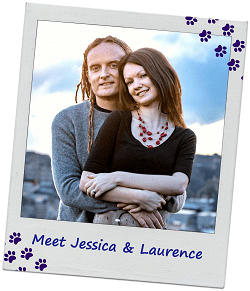 You can call them at 04-66-58-38-00. A second tourist office is located at the Esplanade Charles de Gaulle. 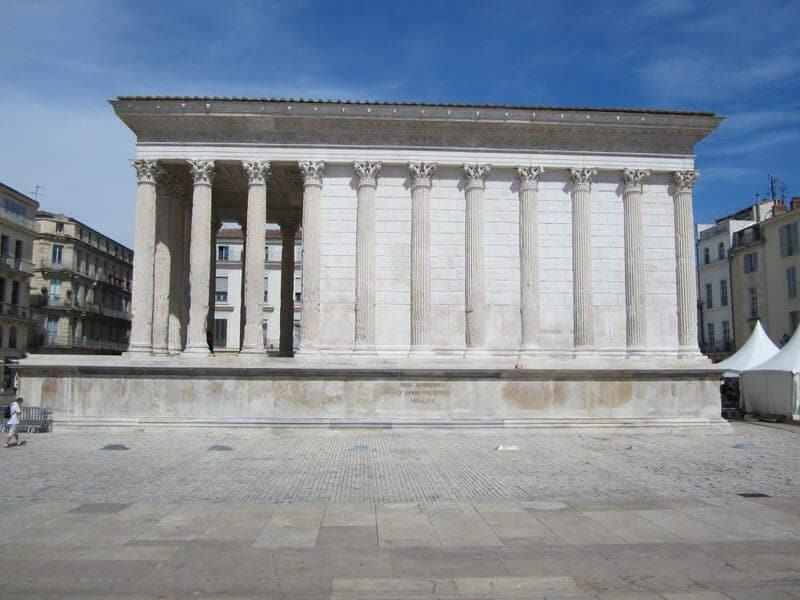 Check official Nîmes tourism website for office hours and for information to help plan your trip. We found the tourism office to be very helpful before and during our trip. There are plenty of tourist attractions, particularly if you love Roman ruins and architecture, to cobble together a great day or two of sightseeing. Here is a list to get you started. Museums: Musée Archéologique (Museum of Archaeology), Musée du Vieux Nîmes (Museum of Old Nimes), Musée des Beaux-Arts (Fine Arts Museum), Musée d’Art Contemporain (Contempory Art Museum). Many of the museums offer free entry. Events: Nîmes hosts a series of festivals and events throughout the year so check the tourism website for what may be happening during your visit. 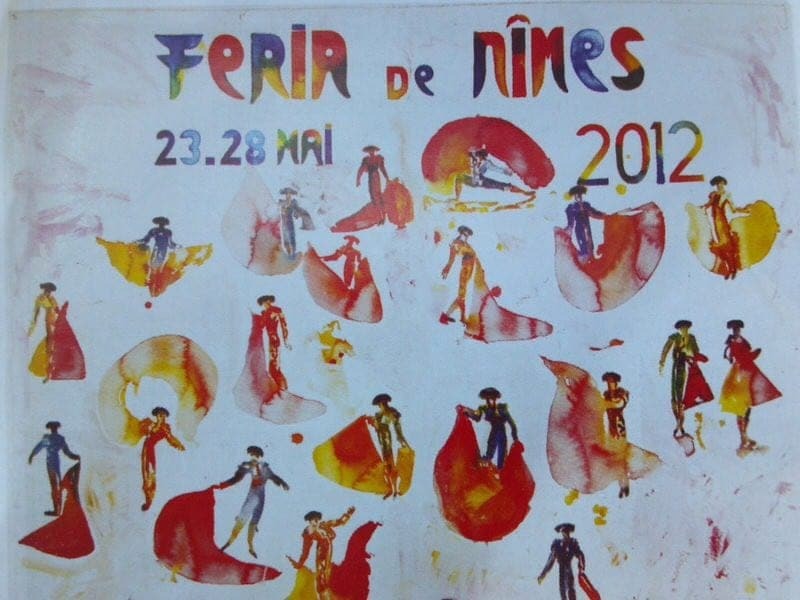 Dates of the Feria de Nîmes? The exact dates vary each year with the dates of Pentecost, which is celebrated 7 weeks (50 days) after Easter Sunday. For example, in 2012 the festival ran from May 23rd to May 28th with Pentecost Sunday (sometimes referred to as Whitsun) on May 27th. In 2014, the festival will take place from June 4th to June 9th. 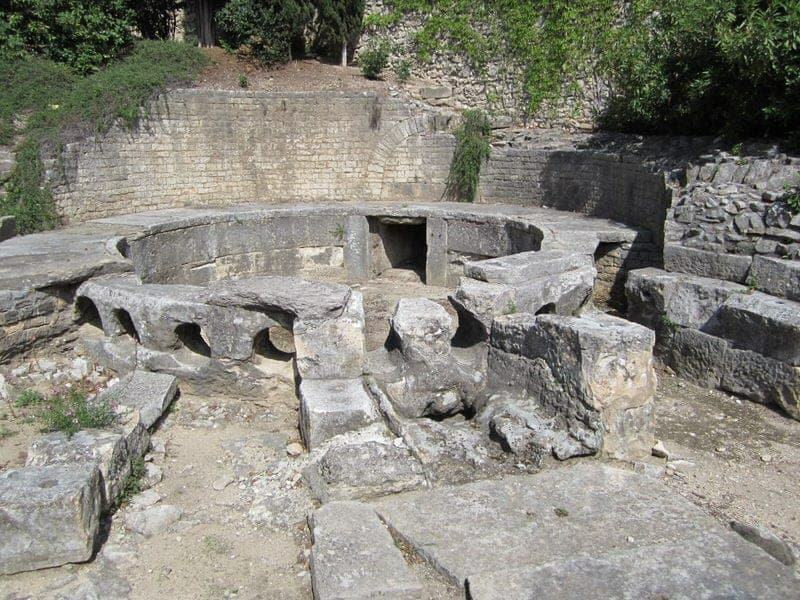 You can find out more on the Nîmes tourism website. In addition to the larger Feria de Pentecôte, another shorter festival, Feria des Vendages (Festival of the Harvest), also takes place for 3 days in September and includes many of the same events and festivities. What Exactly Happens during the Feria de Pentecôte? It is very difficult to find much detailed English-language information on the events during the Feria de Pentecôte. During the 6-day festival, there is a parade, bullfights, equestrian events, musical performances, flamenco dancing performances, holy masses, special activities for children, art displays, and spaces set up for bands and outdoor dancing. There are booths lining several streets selling everything from plastic bulls to flamenco costumes to horseback riding gear. 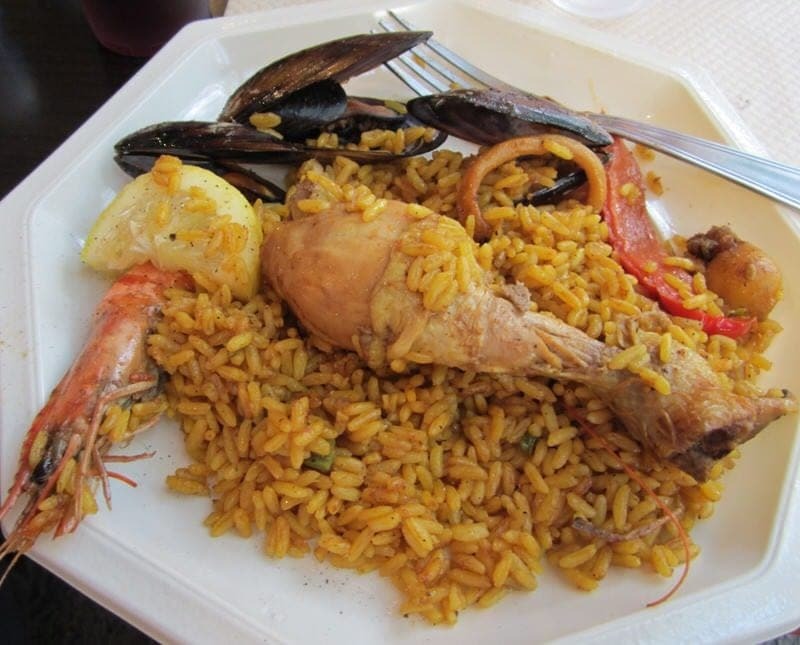 In addition to normal festival food, food vendors sell bull-related specialties (including bull meat burgers and steaks) and a lot of Spanish cuisine such as paella and sangria. 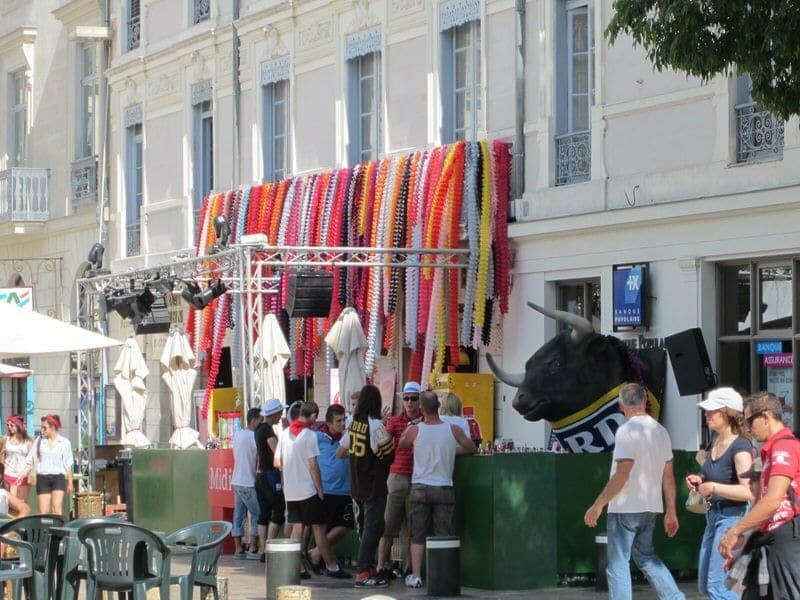 Planning for Events during the Feria de Nîmes? You can get a copy of the festival program that includes the daily events schedule ahead of time by contacting the Nîmes Tourism Office or you can pick one up during your visit. For most events, you just need to show up and no tickets are required. However, the main events that you would need tickets for are the bullfights (corridas) that take place in the Roman arena. You should be able to purchase the tickets online or by phone from the Arènes de Nîmes website. If that doesn’t work, check with the Nîmes Tourism Office. • Nîmes is pronounced “neem”. If you pronounce it with the “s”, you may get some puzzled looks. 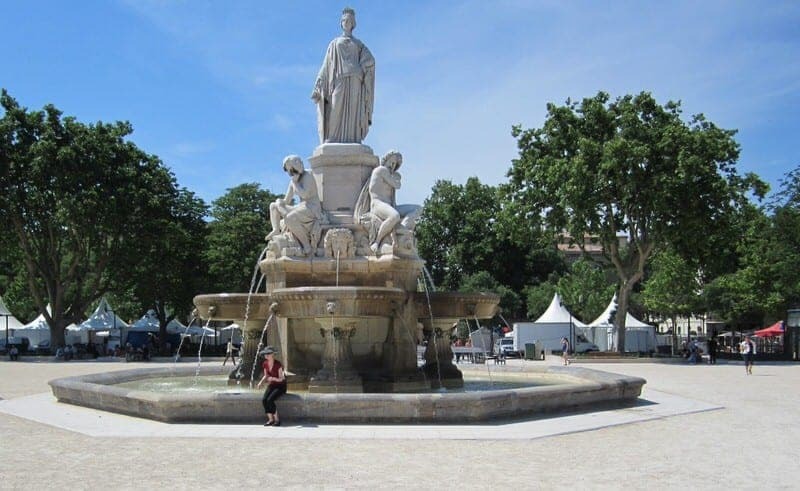 • If you plan to take the bus to or from Nîmes, double check with the driver to make sure you are getting on the right bus as the schedules can sometimes be off. Also confirm the bus schedule for departures times and platform numbers before leaving the station so you can be sure to be back in time. 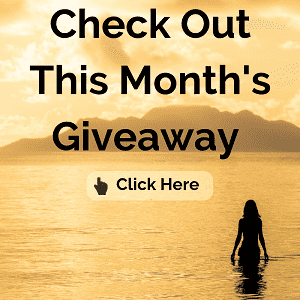 • Wondering what is Pentecost? In Christianity, Pentecost is a holiday commemorating the descent of the Holy Spirit upon the apostles and other followers of Jesus Christ, It is celebrated in different ways with different meanings by a number of Christian denominations and is similar to the Jewish Shavuot. Pentecost Sunday (or Whitsun) is a public holiday in many European nations. 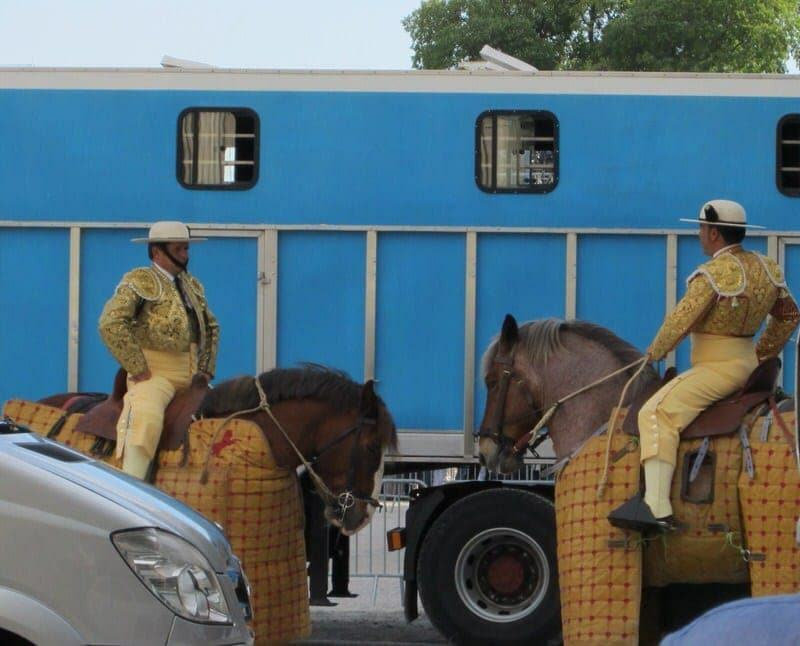 • Note that during the Feria de Pentecôte and Feria des Vendages, the bullfights are normally Spanish-style corridas, meaning the bull is killed and these can be gory. However, the Nîmes amphitheatre also hosts nonviolent bullgames during other times of the year, often labeled as courses camarguaises, where a ribbon is laced between a bull’s horns and people must compete to see if they can get the ribbon from the bull in a set amount of time. • If you do want to attend a bullfight, bullgame, concert, or other ticketed event at the arena, try to book tickets before your arrival to ensure that you get a seat. 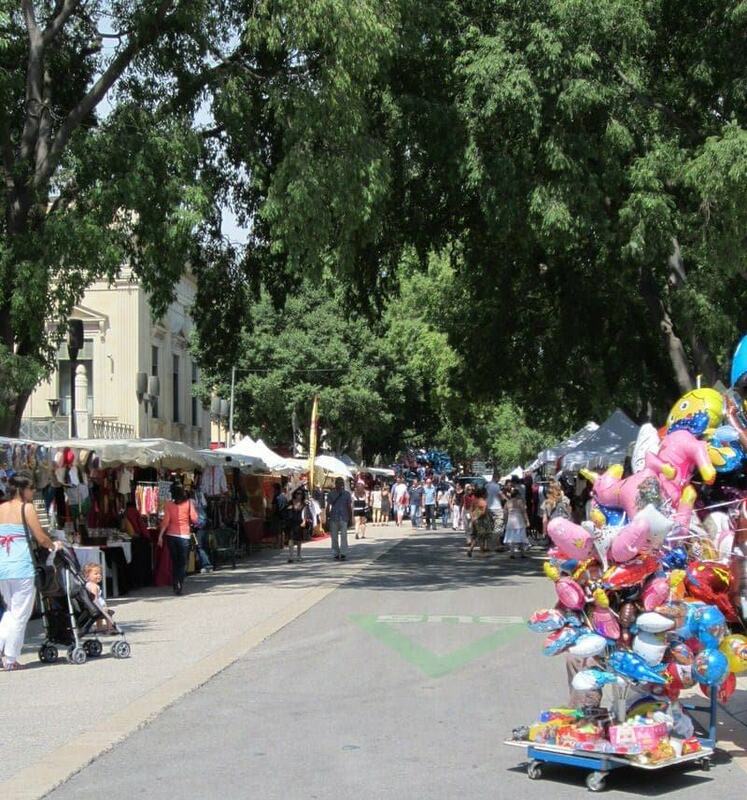 • In addition to the Feria de Pentecôte and Feria des Vendages, the city hosts a number of other festivals and events throughout the year, such as the Roman Games, flamenco festival, bull games, and tons of music concerts. Also, during Thursday evenings throughout July and August the city hosts street markets and live music to create a festive atmosphere for visitors. • If you plan to visit and tour the Arènes (Roman amphitheatre), Maison Carrée, and Tour Magne, you can buy the “Nîmes Roman Pass” to save money. However, this is only a good deal if you plan to not only visit all three sites, but want to go inside each of them. 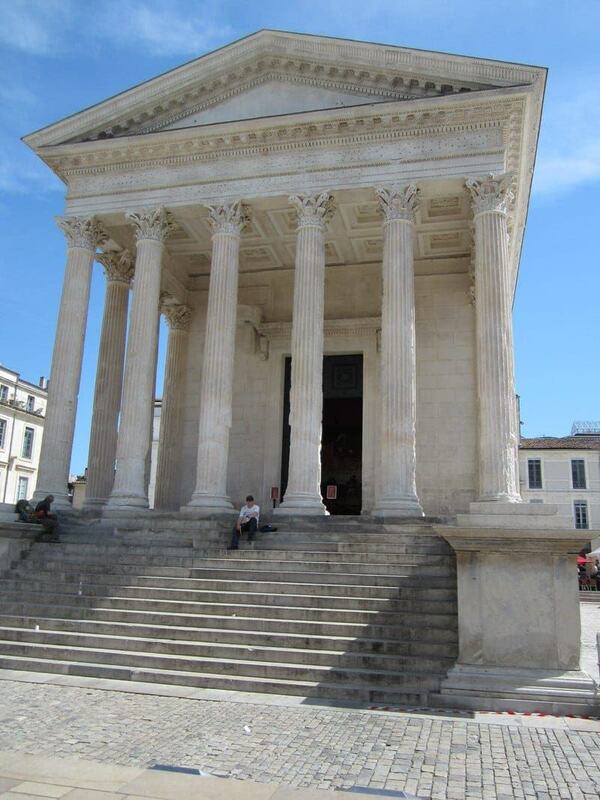 • Most of the sites and activities in Nîmes are outside and require a bit of walking so dress appropriately. We visited in May and it was quite warm, but we were prepared with sunglasses, hats, and water. We arrived in Nîmes after a wonderful morning visit to the Pont du Gard (a must-see site if you are in the area). 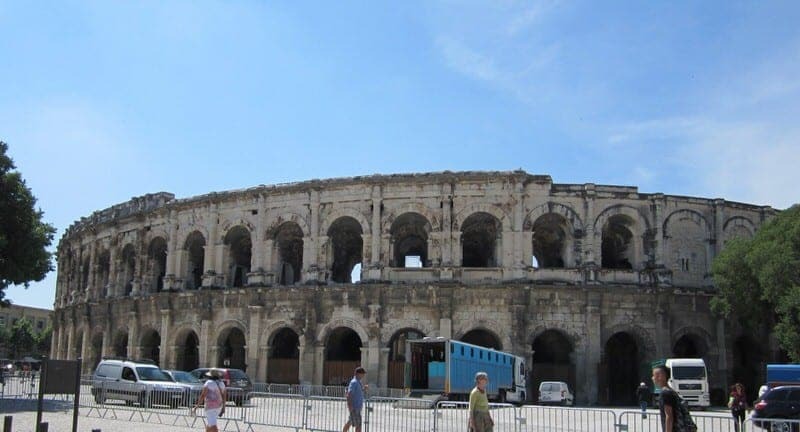 We took a bus from Pont du Gard to Nîmes and arrived about 30 minutes later at the bus station which is located right behind the train station. It is then a short walk to the Roman arena and the main part of the city. First, we stopped at the lovely 19th century white marble Pradier Fountain (Fontaine Pradier) for some pictures. Next, we stopped at the tourist information pavilion near the fountain on Esplanade Charles de Gaulle and got a city map and some brochures. The main TI office is located further along near the Maison Carrée, but we got all we needed for our visit here. As we kept walking, it was impossible to miss seeing the large Roman arena. It is always amazing to see modern life taking place alongside such amazing ancient architecture. The Arènes de Nîmes, the Roman amphitheatre, was closed during the festival because of all the scheduled activities and bullfights (corridas) taking place in the venue; however, we still got a good view of the outside. 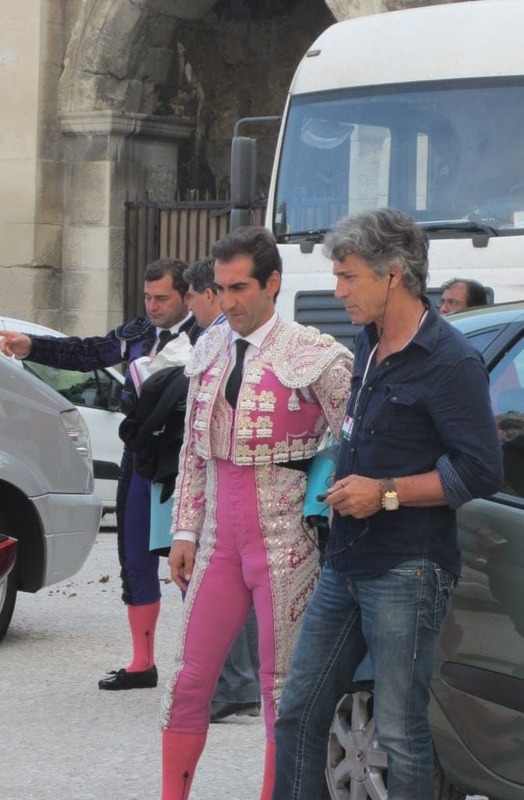 We had chosen not to purchase tickets to attend the corrida that was happening during our visit as we were not sure how we felt about seeing a bullfight and we’d just visited the Roman arena in Arles a couple of days earlier. However, if you get the chance to tour it, this arena is one of the best preserved Roman amphitheatres in the world. We did get the added bonus of seeing some of the bullfighters outside. We walked from the arena to the Palace of Justice (Palais de Justice), past Saint-Paul Cathedral, and to the Maison Carrée. 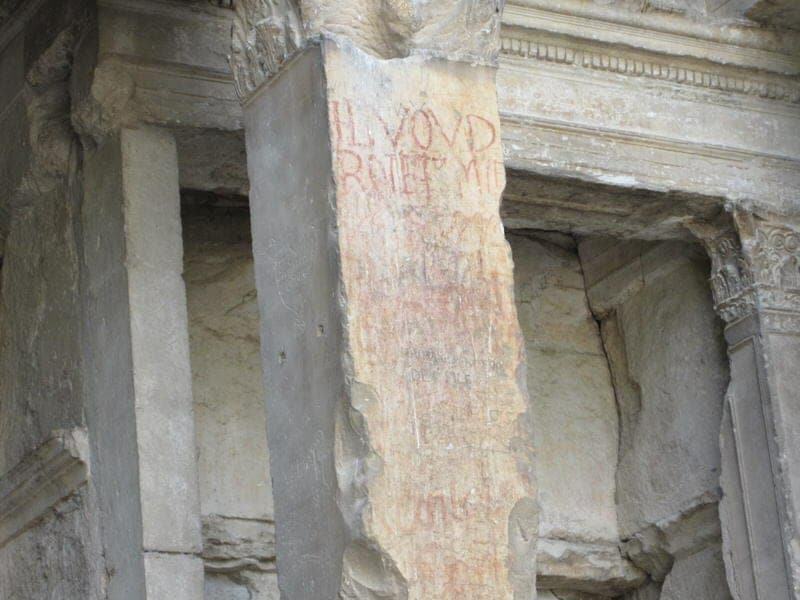 This is one of the best preserved Roman temples in the world. You can walk up the steps and around the exterior for free. You can view the inside and watch a 3-D film for a small fee, but we were content just marveling at the outside of this ancient temple. We had it pretty much to ourselves since everyone else was busy enjoying the festival. Next we walked over to the castellum, which is the site of where the water from the Pont du Gard had come out filling the water distribution tanks located here. After our early morning visit to the Pont du Gard, it was interesting to see where after 30 miles, the water finally came out. However, there is not too much to see here, so I wouldn’t call this a must-see for those not that interested in aqueducts and water distribution. 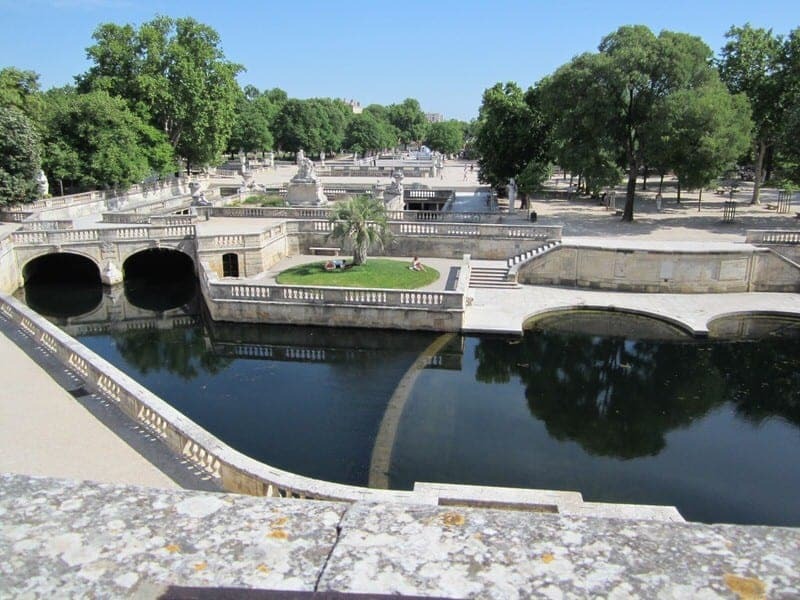 Then on we walked to the Jardins de la Fontaine, which is a large public garden located towards the edge of the city, which includes monuments and canals that date back to Roman times. This was one of the first public gardens in Europe, opening in 1745, and remains a very interesting and pretty park. Remains of two Roman monuments can be visited: the so-called Temple of Diana (may have served as a Roman library, later was used as a monastery) and the Tour Magne, a Roman tower. 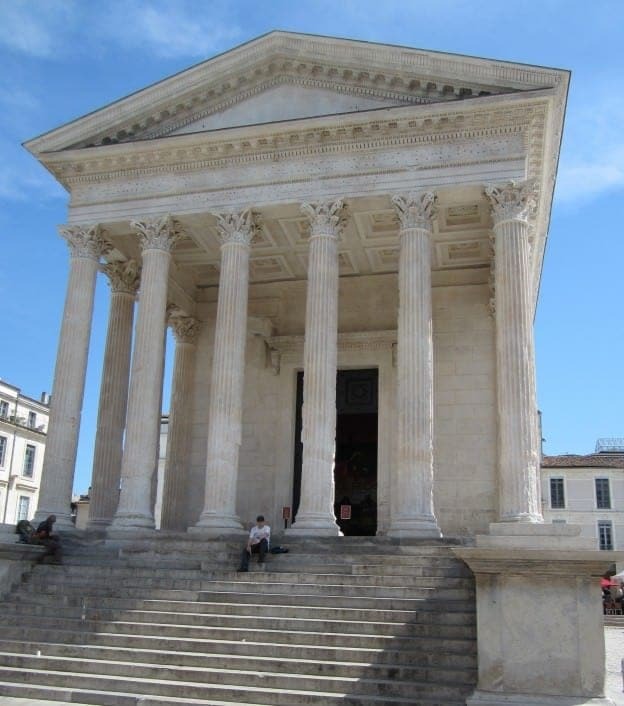 The Tour Magne requires a climb of about 140 steps and a small fee to enter, but the Temple of Diana is on level ground and the ruins can be visited for free. There are also canals, fountains, a small café, and a little stage area located in the park. After all this walking, we were quite tired, so we took a break at a fountain and then headed back towards the Arena to join the festival. The streets were quite packed with vendors and happy visitors enjoying the festivities. After quite a bit of time perusing our food options, we settled for two plates of paella and sangria and had a very wonderful early dinner outside while watching the street scenes around us. After eating, we were able to walk back to the train station and catch a 6:20 (18:20) train back to Avignon. 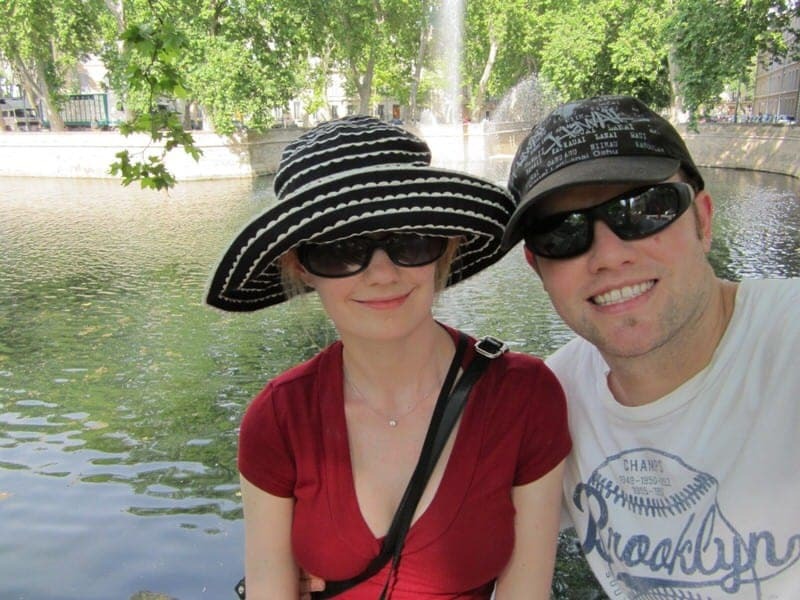 Overall, we had a very pleasant day in Nîmes. 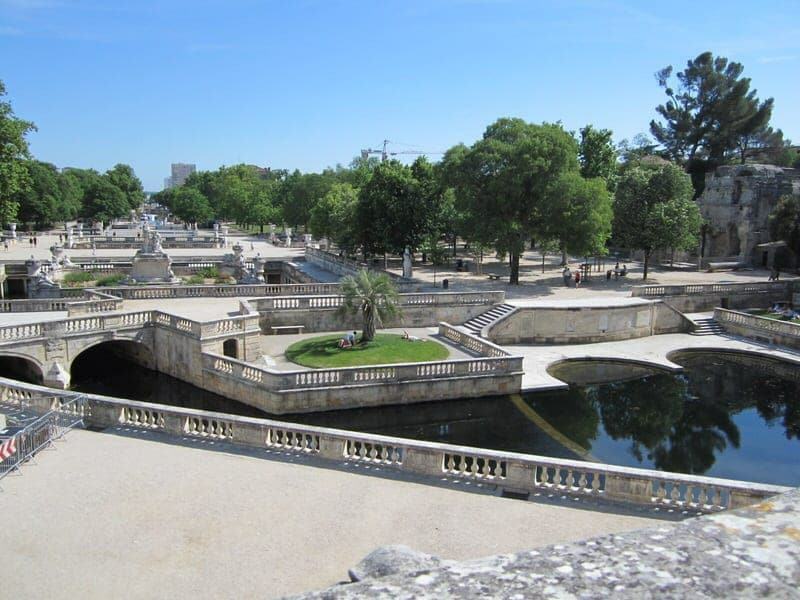 The Roman monuments were quite remarkable and I really loved the Jardins de la Fontaine. It was of course also a treat to have visited during the Feria de Nîmes and we really enjoyed the extra festive environment and the taste of Spanish culture. At times, it really didn’t feel like we were in France as we heard visitors speaking Spanish, ate Spanish food, and listened to Spanish music. However, at other times during our visit it would have been easy to imagine that we were in ancient Rome given all the Roman sites we saw. While we saw all the main Roman sites, we didn’t check out any of the city’s museums because of our limited time even though some offer free admission. 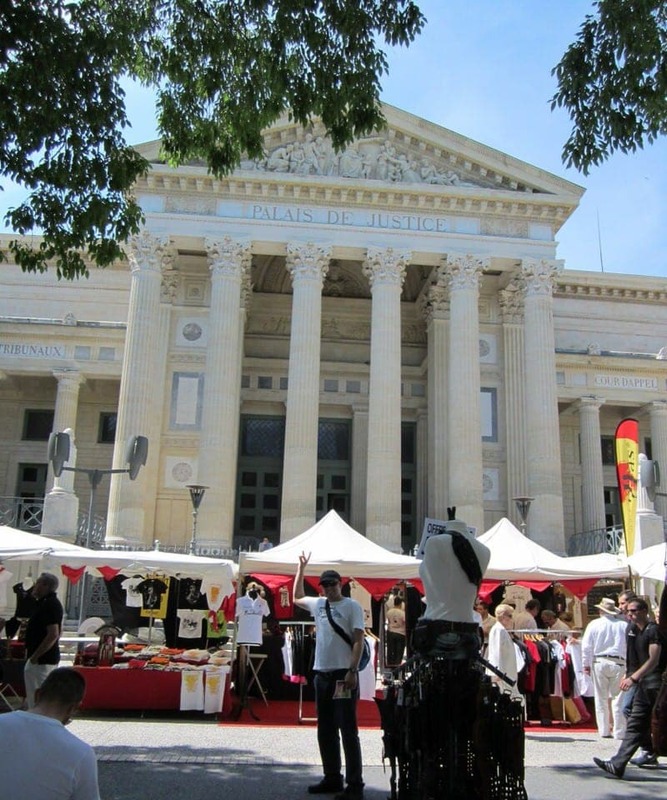 We hope to someday return to Nîmes and experience a bit more of the day-to-day “French” side of Nîmes, but I think we were both happy we got the chance to be a part of this fun festival. 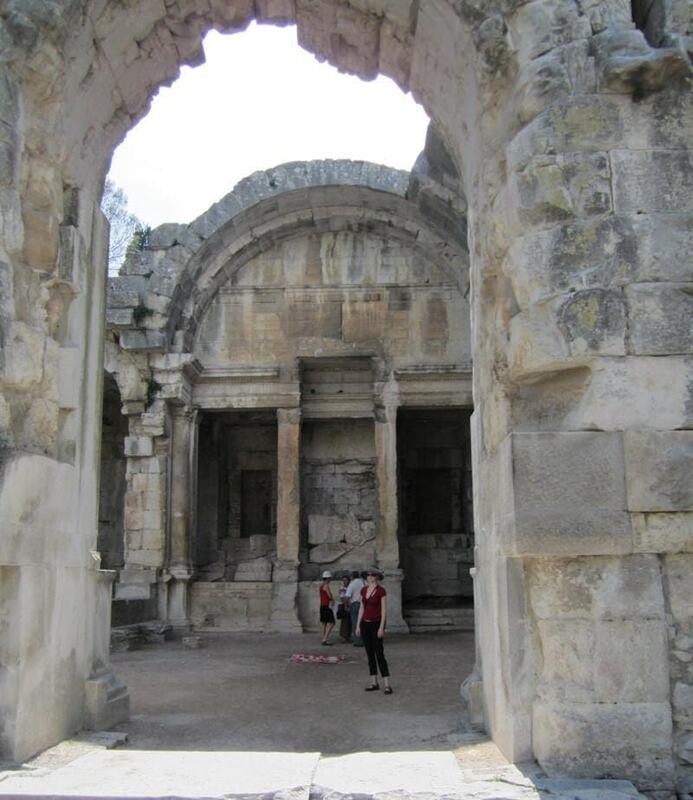 Have questions about visiting Nîmes or attending the Feria de Nîmes? Just ask away. Also, if you want to share your experience visiting Nîmes or have additional tips, we’d love to have you share them with us and our readers! Hi, We plan to visit Nimes and Pont du Gard in June (not during festival). We’ll arrive Nimes by train. If we travel to Pont du gard by bus which stop should we get down at? The bus schedules of Edgard looks complicated.. I could understand that we have to take B21 bus, but couldn’t understand which stop to take. Would we have enough time to see Nimes and pont du gard in a day. 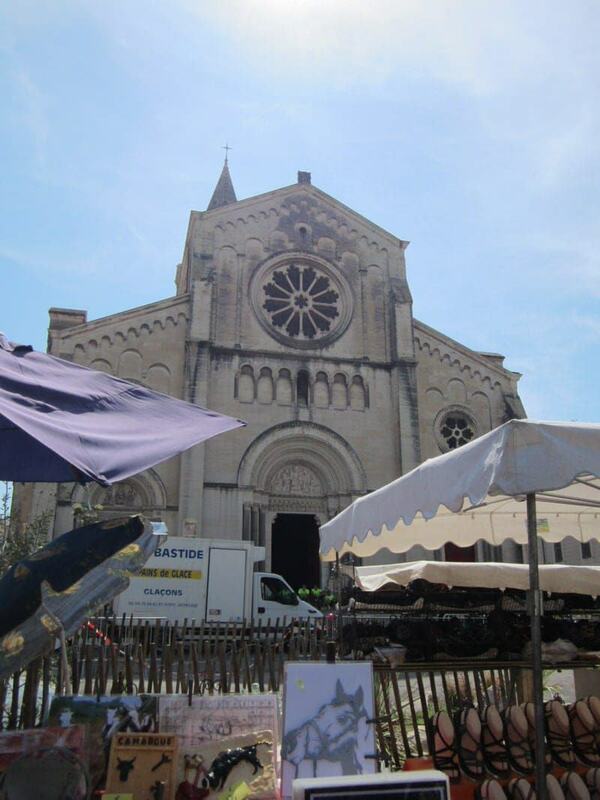 Our return train from Nimes is at 7 p.m. Can you please help me out on the bus route here. Hello, As for the bus stop, I think the closest stop would be “Rond Point Pont du Gard” which will drop you off only a few minute walk away from the visitor center/museum entrance for the Pont du Gard. You can always confirm this at the bus station. Now, I think as far as time, it might be a lot to do in one day depending on when you get to Nimes (earlier the better to have more time). I would suggest that you allow half a day for Nimes and then at least 2 hours to visit Pond du Gard. With the trains and buses schedules, this might not allow you much time. 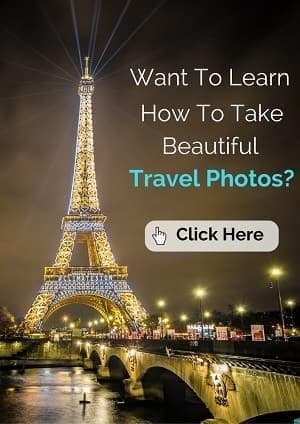 We traveled from Avignon to Pont du Gard (bus), from Pont du Gard to Nimes (bus) and back to Avignon (train) in one day so it is possible, just make sure you work out the schedule in advance. You might also consider if tight on time, taking a cab to and/or from Pont du Gard to ensure you make your return train. Good luck! Interesting place and a great post. I am a new follower. Welcome Colleen, glad to have you as a new follower. Thanks, it is an interesting city, especially if you like Roman history and architecture. It definitely seems less touristed than nearby cities like Avignon and Arles. Yes, we had a fun day. We’d love to go back again to visit the city without the festival too.